One way to measure the political strength of dominionists is to study voting patterns of members of Congress. A recent amendment added to a bill in the U.S. House of Representatives, HR 2123, allows religious discrimination in Head Start hiring which is a serious blow to both religious liberty and civil rights. more The graph on the right shows how Representatives voted. 210 Republicans and 10 Democrats voted for the amendment. 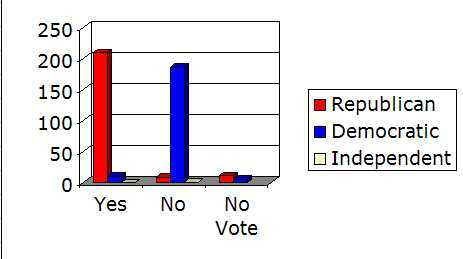 9 Republicans, 186 Democrats and 1 independent voted against the amendment. This graph illustrates that dominionists reside overwhelmingly in one political party. Since the Republican Party has majorities in both houses of Congress, they set the agendas, chair the committees, and decide which bills will and won't come up for a vote. The Christian Coalition was founded in 1989 by television preacher Pat Robertson to take over the Repuliban Party from the bottom up. It has been remarkably successful at getting candidates elected. While the organization is now considered a sinking ship -- they have been surpassed by Focus on the Family and The Family Research Council -- their Congressional scorecards are still useful. Their ratings cover a broader range of issues than the other groups, showing the breadth of their agenda. To read Christian Coalition scorecards for the 108th Congress, and the issues on which they were based, click here. In 2004, forty-eight out of fifty-one Republican Senators voted with the Christian Coalition 100% of the time. One Democrat also received a 100% scorecard -- Zell Miller who has since retired. The graph to the right shows how often members of the U.S. Senate voted with or against Christian Coalition supported bills in the 108th Congress. Republicans are red, Democrats are blue. Forty-one out of fifty-one Republican Senators received scores of 100% from Christian Coalition, meaning they voted with Christian Coalition 100% of the time. Thirty-one out of forty-eight Democrats and one independent received scores of 0. There is a vast chasm between public opinions and voting patterns of dominionist legislators. Consider the Terri Schiavo case. According to a CBS poll, a whopping 82 percent of the public believed "the Congress and President should stay out of the matter." And, according to a Barna Group study, only five percent of the population holds a biblical worldview. "We will not try to reform the existing institutions. We only intend to weaken them, and eventually destroy them," claims a manifesto from Paul Weyrich's Free Congress Foundation. Called The Integration of Theory and Practice: A Program for the New Traditionalist Movement and written by Eric Heubeck in 2001, this manifesto illuminates the tactics of the dominionist movement. For those not aware, Justice Sunday is now a permanent piece of the religious right's arsenal in their war on the separation of church and state . Combining their access to elite politicians and their vast media network, Justice Sundays bring together a sampling of the religious right and congressional leaders like Sen. Bill Frist and Tom Delay, and call for Christian Americans to both pray and act to support judicial causes: the first regarded the nuclear option and the second called for support of conservative nominees to the court. To read more on Justice Sundays I and II, click here. Voter apathy is key to the phenomenal ascent of the theocratic right in the U.S. government. "The apathy of other Americans can become a blessing and advantage to Christians," wrote Mark Beliles and Stephen McDowell in 1989 in America's Providential History, a popular textbook for Christian schools and the Christian homeschool movement. For the authors, the term "Christian" refers uniquely to people who share their biblical worldview. The word "reform" is key. It means reforming the United States so that it becomes a "Christian" nation. The answer to the power of the Christian Right is electoral power of our own. No excuses. Many of us have tended to abandon this cornerstone of citizenship in favor of other things. It is time to get our priorities strait. Less talk, more action. Less entertainment, more citizen involvement. Less TV and sports. More electoral politics. Do we want the theocrats to win? More electoral politics. While a record number of people voted in the 2004 elections, 100 million eligible voters didn't vote. Dominionists began to seriously mobilize politically in the United States twenty-five years ago, and it is being noticed only now! We need to educate the American public about this ideology. The theocratic right has historically targeted midterm elections because voter turnout is much lower than in Presidential elections. Those who favor Democracy and a pluralistic society need to be passionate about politics. Legislators representing the theocratic right can be replaced in the 2006 elections, but it will take hard, sustained work, and lots of passion. And traditional Republicans need to wake up. George Bush was re-elected because he hid behind moderates. Arnold Schwarzenegger, Governor of California, spoke at the Republican Convention about how the Republican Party is tolerant and inclusive. His speech demonstrates that this country values tolerance and diversity. You're going to run over them. Get around them, run over the top of them, destroy them - whatever you need to do so that God's word is the word that is being practiced in Congress, town halls and state legislatures. That's your job. Christine Todd Whitman, former Governor of New Jersey who favors environmental protections, stepped down as director of the Environmental Protection Agency, an agency that has become, under the Bush administration, an advocate for polluters. Strangely, after she left the EPA in frustration, she then went on to lead the Bush re-election campaign in New Jersey. As long as the theocratic right can hide behind moderates, it will be easier for them to remain in power. And we need to stop using terms such as "Christian," "conservative" and most of all "moral," and start calling the dominionist movement what it is. Chip Berlet and Margaret Quigley, senior analysts at Political Research Associates, suggest the term "theocratic right:"